Benjamin was born on June 25, 2008. This little boy had the odds stacked against him before he ever even entered this world. 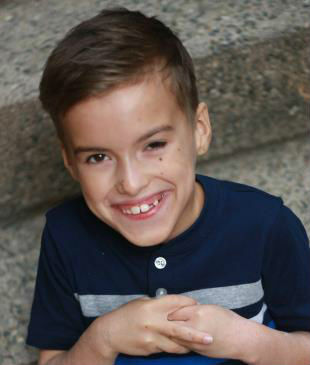 Doctors warned Benjamin’s mother while she was pregnant, that her son would most likely be born without a brain, and would fail to thrive because most of his abdominal organs would be on the outside of his body. When Benjamin was born a month early, he was immediately flown to the children’s hospital in Portland. Benjamin’s prognosis was better than the doctors had predicted, however he would still be in for the fight of his life. Benjamin has a condition called CRASH syndrome. His condition is extremely rare and causes many medical challenges including hydrocephalus, adducted thumbs, aphasia, spastic paraplegia, cystic fibrosis, seizures, and much more. This is a condition that will challenge Benjamin’s entire life, but this fifth-grade young man refuses to let it bring him down. He has already proven that he is a walking miracle. Benjamin is excited to be a Sparrow and show others how to be a warrior when faced with so many challenges. Benjamin will be adopted as a Sparrow to Roosevelt Elementary School. Students at Roosevelt will work hard to raise money for Benjamin through sponsored community service and fundraising projects.